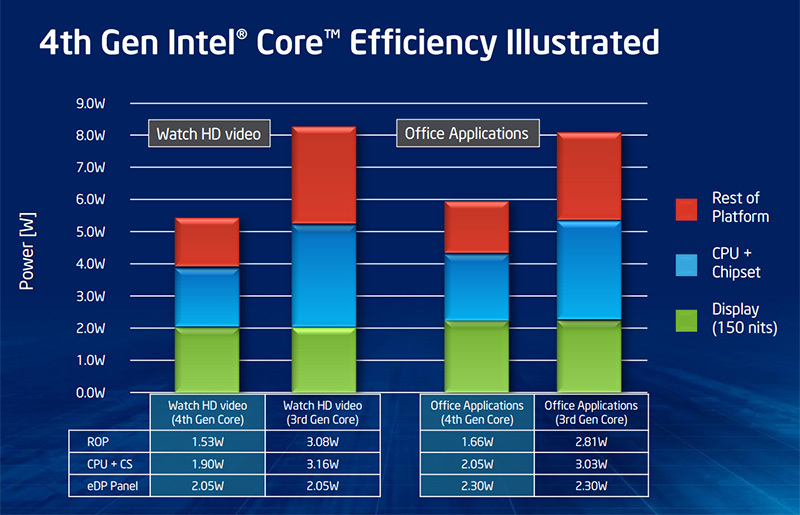 Intel has taken a multifaceted approach to enhancing efficiency in Haswell as both a processor and a platform. At a silicon level, the company has introduced fine-grained control over which parts of the die are turned on or off. As we know, existing Ivy Bridge processors - that feature up to four IA cores, a graphics processor and a memory controller all hooked up to a ring-based interconnect - allow for the CPU and GPU to go idle, but other power-sucking components remain largely active. With Haswell, the philosophy, or the theory, is that if you don't need it, it ought to be turned off. In order to make this happen, Intel has added more power-gating and decoupled the ring-based interconnect and L3 cache from the IA cores - allowing, for example, the GPU access to the ring bus without waking the IA cores. Expanding on this granularity, ultra-low-power Haswell mobile processors will be equipped with deeper C-States (C8, C9, C10) that allow practically everything to be turned off when idle. In addition, fourth-generation processors are said to switch between states 25 per cent faster than their third-generation predecessors. 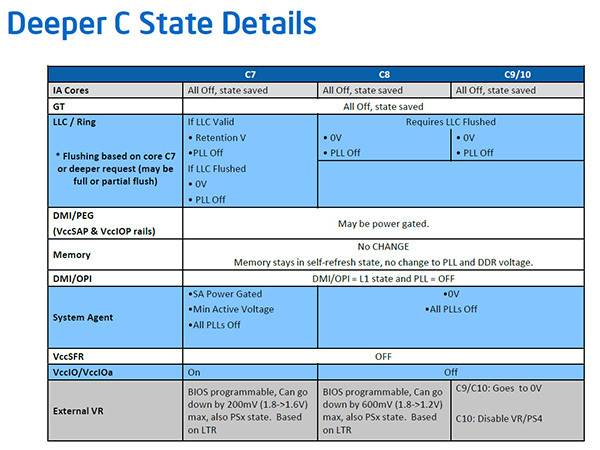 Taking into account connected systems as a whole, Intel has also created a more suitable middle ground between the ACPI specification's S3/S4 sleep and S0 active states by introducing new active-idle states dubbed S0i1 and S0i3. With previous-generation platforms, putting a computer to sleep and waking back up was achievable in just a couple of seconds, but the experience wasn't as quick as, say, on a smartphone or tablet. 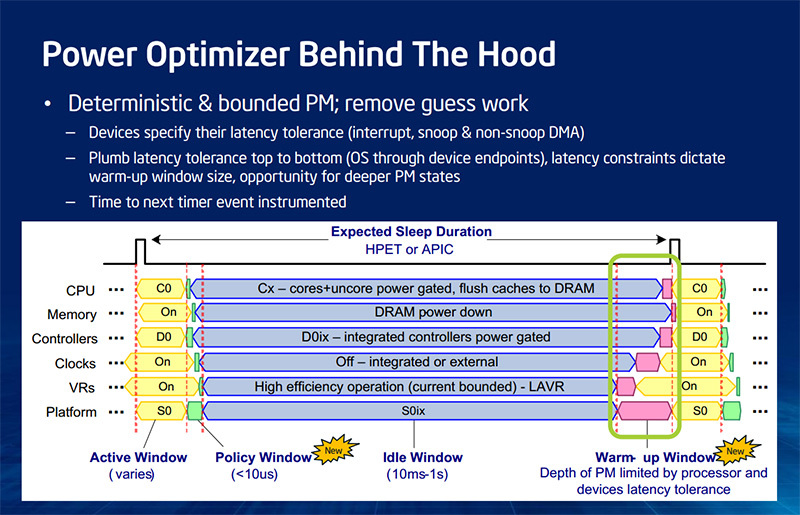 Learning from those platforms, and already available in certain Intel Atom processors, the low-power S0ix active idle states are designed to deliver power savings similar to that of S3 sleep, with the added incentive of being able to return to S0 active almost instantaneously (we're talking a matter of milliseconds). This low-power 'connected standby' state is said to be 20 times more efficient than the previous generation, and with the Haswell platform designed to run in this mode the majority of the time, the power savings should certainly add up. The goal is to make mobile PCs function in a manner similar to smartphones and tablets. In theory, mobile Haswell devices will remain connected to the web in an ultra-low-power state at all times, allowing the PC to stay up-to-date and wake instantly. Additional power-gating and a greater number of idle states are just the tip of the iceberg as far as system-wide efficiency is concerned. The CPU, arguably, isn't the problem, as Intel's power-saving enhancements can be nullified by any other component in a system. This is an obvious drawback to a PC industry that has remained as flexible as possible. A practically infinite choice of components is available - both in terms of hardware and software - but getting them all to work together in unison with the aim of reducing power consumption for the sake of battery life has been difficult at best. With Haswell, Intel will be working closely with manufacturers to ensure that recommended components - as well as recommended drivers and firmwares - are used to drive down power consumption for the rest of the platform. It's this compound effect that Intel hopes will drastically increase battery life on mobile computers. Over the years, various components have been pulled into the CPU die in order to further optimise each new architecture, and in Haswell processors we also will see Intel incorporate an on-die voltage regulator. The technology, dubbed Fully Integrated Voltage Regulator (FIVR), promises virtually no ripple and allows for multiple voltage rails as well as fine-grain power management for on-die components such as the IA cores, GPU and memory controller. This puts the CPU in control of power delivery to its various parts, and will allow Haswell processors to transition between frequencies and enter and exit power states at greater speed, thereby further increasing overall efficiency. Microsoft's Windows 8 operating system is another key component in achieving ultra-low-power consumption and maximum efficiency. The software champions a 'connected standby' experience, which Microsoft states "brings the smartphone power model to the PC." It provides an instant-on, instant-off user experience that users have come to expect on their phone. And just like on the phone, Connected Standby enables the system to stay fresh, up-to-date, and reachable whenever a suitable network is available. Windows 8 supports Connected Standby on low-power PCs platforms that meet specific Windows Certification requirements. Having your PC still allow incoming calls or feed updates while in an active idle state (S0ix) sounds like a good thing, but Microsoft requires all systems supporting Connected Standby to meet a specific requirement: "all Connected Standby systems must drain less than 5 per cent of system battery capacity over a 16-hour idle period in the default shipping configuration." In order to meet the requirement, Haswell devices harness the power of Windows 8 to coalesce interrupts and prevent the system from powering up unnecessarily. Unlike Windows 7, which polled periodically for interrupts, Windows 8 polls only on the request of a device, and Intel has worked to group together multiple interrupts which can then be carried out at the same time whenever possible, minimising the process. Instead of asynchronous and frequent activity from multiple devices with short idle intervals, we have aligned activity that creates extended idle periods. 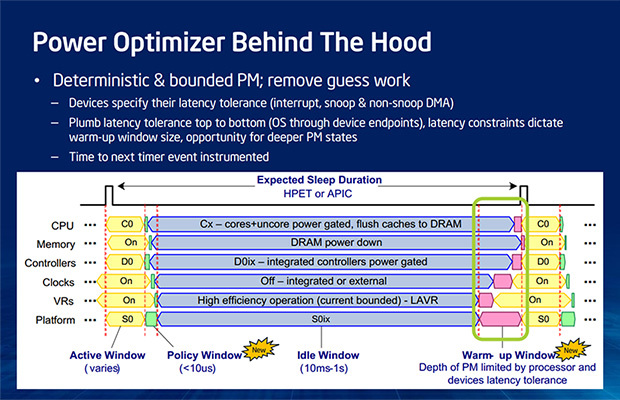 To achieve this result, Intel has created a Power Optimizer framework that uses new bus extensions to report latency tolerance of every connected device. The end result is the ability to determine and maximise the amount of time it can remain in an idle S0ix state until the next interrupt. Intel has confirmed that these power-saving features - including the S0ix active-idle state - will be available across the entire Haswell range. The benefits, however, will be felt most keenly in mobile devices aiming to offer an all-day, always-on PC experience.